The Mole Salamander as its name implies spends most of its time underground. They are large headed with dark brown, black or dark gray bodies with lighter irregular speckling. The underside of the spotted salamander is pinkish gray. 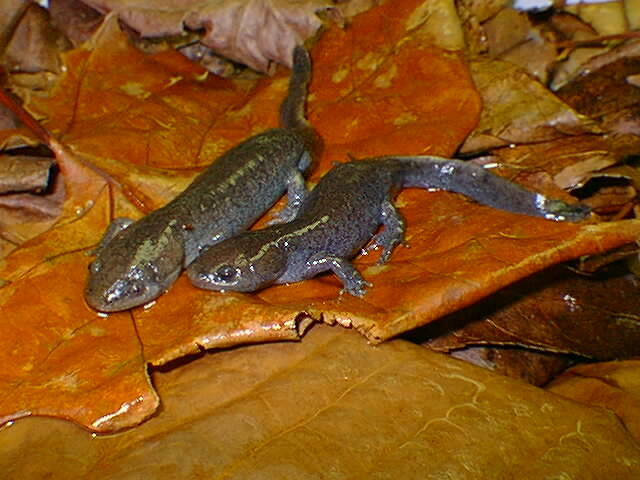 This 8–10 cm (3–4 in) long salamander is typically seen following late fall, winter and spring rains. They are often found under rotten logs or in breeding ponds. The mole salamander feed on a variety of small invertebrates. Mole salamanders are commonly found at the field station in ponds living as neotenic adults. These individuals are aquatic adults that are sexual mature yet still retaining their larval features such as gills. The Scarlet snake is a non-venomous native of the southeastern United States. They are small, secretive and semi-fossorial snakes; about 36-666 cm long (14-26 inches). Scarlet snakes are light gray or cream with black bordered red blotches down their length. Their shouts are typically red. The pattern may appear to be banding like the coral snake or scarlet king snake however in the scarlet snake the belly is always base color. 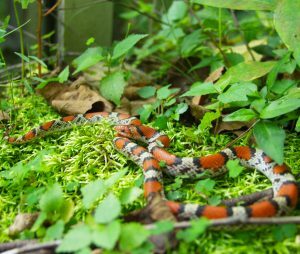 Scarlet snakes maybe found in hardwood, mixed, or pine forest/woodland and adjacent open areas with sandy or loamy well-drained soils. They feed on lizards, salamanders, small rodents, reptile eggs and other snakes. Scarlet snakes lay eggs (3-8) at the Field Station throughout the spring that hatch in early fall.